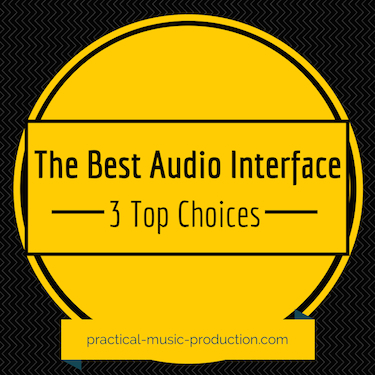 Home » Gear » What is the Best Two Channel Audio Interface for Your Home Studio? What is the Best Two Channel Audio Interface for Your Home Studio? Choosing the best two channel audio interface for your home studio is one of the biggest decisions you’ll make when you’re bringing together your studio equipment. Your interface will be one of the central hubs in your studio – for recording and for mixing. You already know the fundamentals of what to look for in a great-quality interface. So here’s a quick run-down of 3 of the best tools that you can choose from to establish your setup and start making good music. For me, this is the best two channel audio interface you can choose for your home setup. The 2i2 has established itself at the top of the tree for quite a while now, and always makes the end-of-year lists for the best USB audio interface. 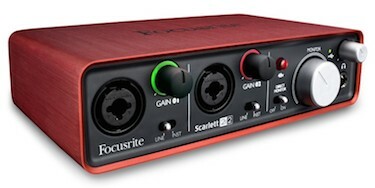 With the Scarlett 2i2, you can capture your sounds quickly, easily, and in superb quality with Focusrite’s world-renowned preamps and converters. Pro-level condenser and dynamic microphonescan be used for recording, alongside any instruments that use jack connections like guitars and keyboards. There’s stress-free connectivity to your DAW computer, with no need for an extra power supply – the USB connection to your computer also powers the 2i2. The small size and light weightmakes it easy to carry around and use with a laptop, and the extra plugin bundle definitely helps you squeeze more life into your mixes. The PreSonus AudioBox, whilst not having the same inbuilt quality as the Scarlett 2i2, is still a superb interface. It’s ideally suited for beginners, with a price point to match. Like the Scarlett, it’s quick and easy to set up and you’ll be recording with it in no time. It’s powered through the USB connection, and the light weight and small size of the unit give it extra flexibility, making it ideal for making music with a laptop. High-quality recordings are easy to achieve, helped along by the 24-bit converters and pro-sounding preamps. 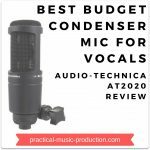 Onboard phantom power gives you the option to use condenser mics as well. 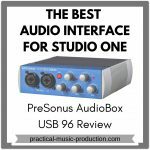 The AudioBox is also at the center of the always-popular PreSonus AudioBox Studio Bundle, which brings together several tools into one package and is aimed at those who are want the complete starting package. It contains the AudioBox, Studio One Artist software, the M7 condenser microphone, and the HD7 headphones. 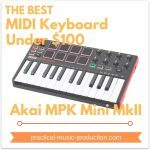 You will need more gear if you want to take the next step and start producing better music, but the Bundle is a fantastic starting point. 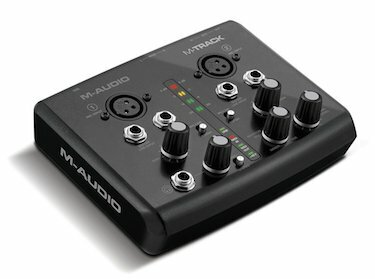 The M-Track is the follow-up to the Fast Track interfaces from M-Audio. The M-Track is superb value and a great choice for new home studio owners. It’s designed differently to the 2i2 and the AudioBox, but the same core elements are still there. You get great sound quality from the preamps and converters, and it’s super-portable for any producers who like recording with their laptops in different rooms and locations. The M-Track also comes bundled with Ableton Live Lite, which gives you a quick and easy way to try out the features of Live without spending big money up front. Combining an audio interface from the above list with the rest of your production setup will be a positive step forward in your music making. 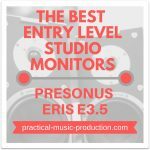 They all have impressive preamps and convertersto help with the quality of your recordings, and your mixing life will be made easier when you hook up a quality pair of monitors. 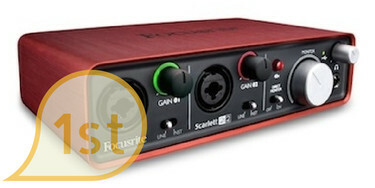 Coming up with only one choice for what is the best two channel audio interface will always be a personal decision, but if I could only choose one then it would have to be the Scarlett 2i2. Inferior preamps are often one of the biggest downfalls in home recording, but the inclusion of Focusrite preamps and the sampling rate of 96 kHz really helps to push the quality of the 2i2 to another level. To find out more about any of these interfaces and to get a closer look, you might want to check out the reviews below.